European Waterways is helping travellers “get back to nature” for spring 2019 with 10% off cabins and charters on select hotel barge cruises that take guests through the deep countryside of Europe. Navigating the picturesque canals, the vessels meander through the less populated regions of the country, providing an ideal platform from which to view the rituals of spring, when nature comes to life along the banks. The specials are available on select cruises in April and May 2019, good when booked by January 7, 2019.
said Derek Banks, European Waterways’ managing director. “From otters and eagles in Scotland to tulips in Holland and the wild horses of the Camargue on the Mediterranean coast, there are always amazing natural sights to see, but Burgundy is special, particularly in April and May,” said Banks. Among the hotel barges offering 10% off on cabins and charters is the 8-passenger L’Art de Vivre, ideal for discovering Burgundy. Mallards, swans and moorhens can be spotted nesting in the rushes or taking their first swims with newly hatched young, while Charolais cattle and maybe an occasional wild boar will come down to drink. Special rates on select L’Art de Vivre departures in 2019 start at €3,465 per person, based on double occupancy, a total saving of €770per cabin. Whole boat charter prices start at €25,740, a saving of €2,860. Some restrictions may apply. 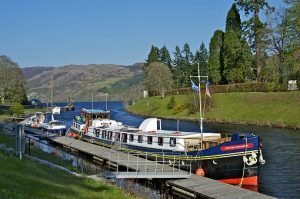 In Scotland, European Waterways’ 12-passenger Spirit of Scotland and 8-passenger Scottish Highlander hotel barges will treat guests to a wide variety of wildlife as they cruise the Caledonian Canal and traverse a chain of inland lakes, or “lochs”. While “Nessie” is often too shy to show herself in Loch Ness, guests may be lucky enough to see otters in the water and birds of prey in the skies above. For those wanting a closer look at the raptors, they can get up close and personal with exclusive birds of prey demonstrations, featuring the aerial acrobatics of falcons, hawks, eagles and owls. 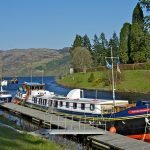 The Scottish Highlander is offering special rates on select departures in spring 2019 starting at €3,321 per cabin, based on double occupancy, for a total saving of €738 per cabin. Whole boat charter prices start at €25,560, a saving of €2,840. Some restrictions may apply.